Download "Course Outline. 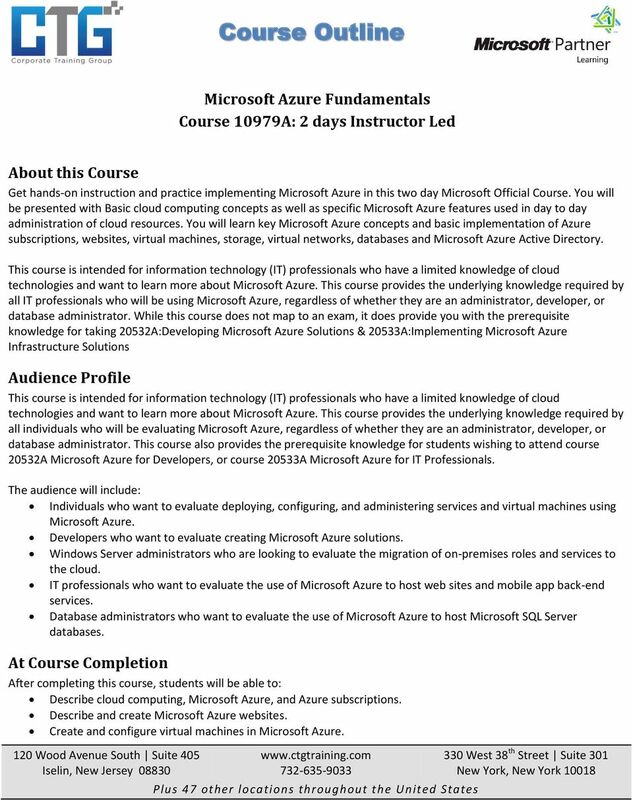 Microsoft Azure Fundamentals Course 10979A: 2 days Instructor Led. About this Course. Audience Profile. At Course Completion"
1 Microsoft Azure Fundamentals Course 10979A: 2 days Instructor Led About this Course Get hands-on instruction and practice implementing Microsoft Azure in this two day Microsoft Official Course. You will be presented with Basic cloud computing concepts as well as specific Microsoft Azure features used in day to day administration of cloud resources. You will learn key Microsoft Azure concepts and basic implementation of Azure subscriptions, websites, virtual machines, storage, virtual networks, databases and Microsoft Azure Active Directory. This course is intended for information technology (IT) professionals who have a limited knowledge of cloud technologies and want to learn more about Microsoft Azure. This course provides the underlying knowledge required by all IT professionals who will be using Microsoft Azure, regardless of whether they are an administrator, developer, or database administrator. While this course does not map to an exam, it does provide you with the prerequisite knowledge for taking 20532A:Developing Microsoft Azure Solutions & 20533A:Implementing Microsoft Azure Infrastructure Solutions Audience Profile This course is intended for information technology (IT) professionals who have a limited knowledge of cloud technologies and want to learn more about Microsoft Azure. This course provides the underlying knowledge required by all individuals who will be evaluating Microsoft Azure, regardless of whether they are an administrator, developer, or database administrator. This course also provides the prerequisite knowledge for students wishing to attend course 20532A Microsoft Azure for Developers, or course 20533A Microsoft Azure for IT Professionals. The audience will include: Individuals who want to evaluate deploying, configuring, and administering services and virtual machines using Microsoft Azure. Developers who want to evaluate creating Microsoft Azure solutions. Windows Server administrators who are looking to evaluate the migration of on-premises roles and services to the cloud. IT professionals who want to evaluate the use of Microsoft Azure to host web sites and mobile app back-end services. Database administrators who want to evaluate the use of Microsoft Azure to host Microsoft SQL Server databases. At Course Completion After completing this course, students will be able to: Describe cloud computing, Microsoft Azure, and Azure subscriptions. Describe and create Microsoft Azure websites. Create and configure virtual machines in Microsoft Azure. 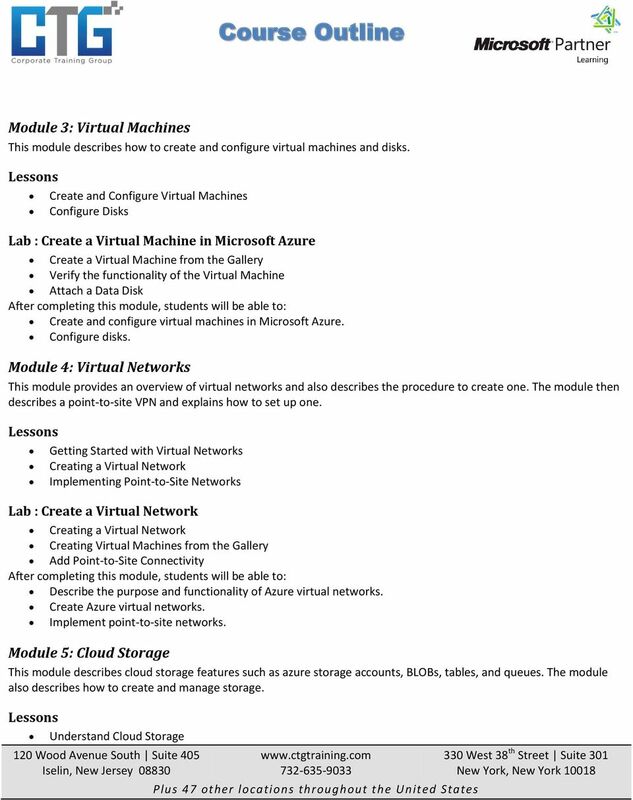 2 Create a Microsoft Azure virtual network. Describe and configure Microsoft Azure storage. Describe and deploy databases in Microsoft Azure. Describe and configure Microsoft Azure Active Directory. Module 1: Getting Started with Microsoft Azure This module describes the features of Microsoft Azure and the services it provides. The module also explains how to manage Microsoft Azure by using the Azure portal, Visual Studio, and SQL Server Management Studio. In addition, the module describes how to manage subscriptions and billing. What Is Cloud Computing? What Is Azure? Managing Azure Subscription Management and Billing Lab : Using the Microsoft Azure Portal Add a Co-Administrator View Billing Data Describe cloud computing. Describe Microsoft Azure and the various Azure services. Manage Azure services from the Azure portal. Manage an Azure subscription and billing. Module 2: Websites and Cloud Services This module explains the procedures for creating and configuring websites and cloud services. The module also describes how to deploy and monitor websites. 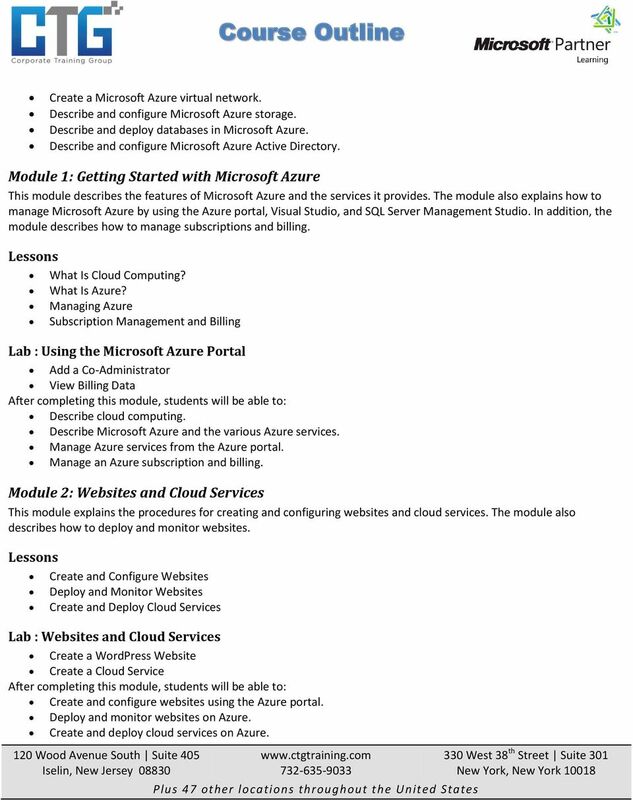 Create and Configure Websites Deploy and Monitor Websites Create and Deploy Cloud Services Lab : Websites and Cloud Services Create a WordPress Website Create a Cloud Service Create and configure websites using the Azure portal. Deploy and monitor websites on Azure. Create and deploy cloud services on Azure. 4 Create and Manage Storage Lab : Configure Azure Storage Create an Azure Storage Account Create and Manage Blobs Upload Files Describe the features and benefits of cloud storage. Create and manage storage in Azure. Module 6: Microsoft Azure Databases This module provides an overview of the relational database deployment options. The module also describes how to create and connect SQL databases. 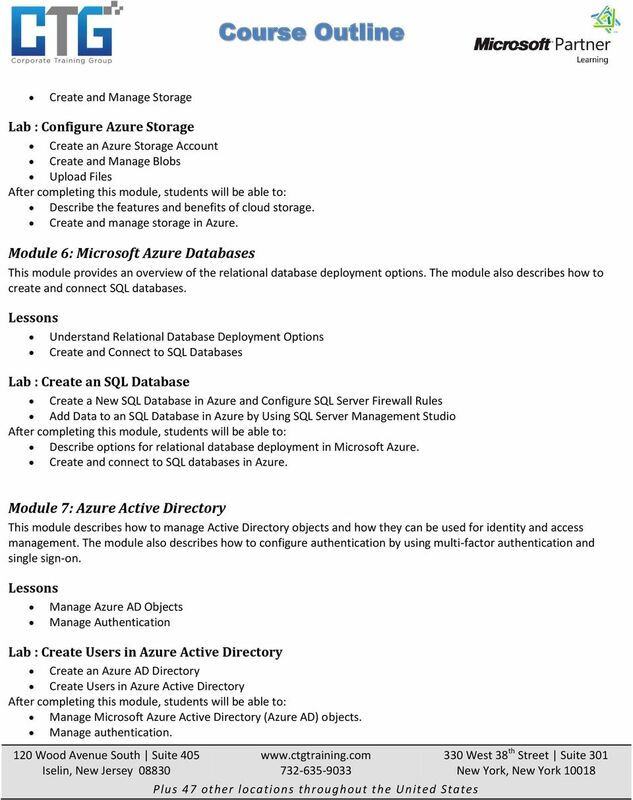 Understand Relational Database Deployment Options Create and Connect to SQL Databases Lab : Create an SQL Database Create a New SQL Database in Azure and Configure SQL Server Firewall Rules Add Data to an SQL Database in Azure by Using SQL Server Management Studio Describe options for relational database deployment in Microsoft Azure. Create and connect to SQL databases in Azure. Module 7: Azure Active Directory This module describes how to manage Active Directory objects and how they can be used for identity and access management. The module also describes how to configure authentication by using multi-factor authentication and single sign-on. Manage Azure AD Objects Manage Authentication Lab : Create Users in Azure Active Directory Create an Azure AD Directory Create Users in Azure Active Directory Manage Microsoft Azure Active Directory (Azure AD) objects. Manage authentication. 5 Module 8: Microsoft Azure Management Tools This module provides an overview of the tools that you can use to manage Microsoft Azure such as Azure PowerShell, Visual Studio, and Xplat CLI. 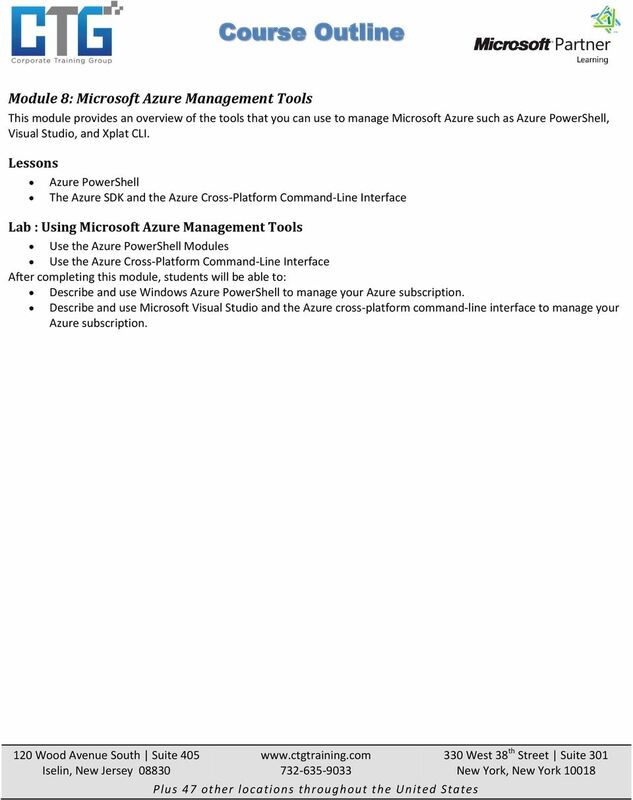 Azure PowerShell The Azure SDK and the Azure Cross-Platform Command-Line Interface Lab : Using Microsoft Azure Management Tools Use the Azure PowerShell Modules Use the Azure Cross-Platform Command-Line Interface Describe and use Windows Azure PowerShell to manage your Azure subscription. Describe and use Microsoft Visual Studio and the Azure cross-platform command-line interface to manage your Azure subscription. The secondary audience consists of those seeking certification in the , Installing and Configuring Windows Server 2012 exam.